I realized that I sort of left this blog hanging in limbo when a co-worker approached me and gingerly asked if Biruk made it home. She had been following the blog – but I guess I never actually said that we made it home. We were welcomed [back] to America on Tuesday April 3rd. We had a wonderful reception at the airport and were thrilled to be reunited with family and friends. When we first arrived home, the kids gave Biruk a tour of the house and showed him his room. It was a wonderful moment – watching all four of our kids run around the house together. The following day, Biruk seemed to touch and play with every.single.thing. in our home. I think he was definitely overstimulated. Everyone seems to wonder about Biruk’s reaction to things. Here are some highlights from his first 30 days in America. After our first flight from Ethiopia to Germany I asked him what he thought about flying and he said, “it’s so easy”. I was doing some banking at my credit union in Walmart and behind me there was a display of Doritos. Biruk said he wanted some and I told him that was fine – he could get some. He walked over to the Doritos, grabbed a bag and handed it to the bank teller. I had to explain that the registers were elsewhere. Biruk took great pleasure in keeping track of my husband and I using an app to find lost iphones – he could see where we were at all times based on our iphones…until he accidentally deleted everything on my iphone, my husband’s iphone, and our ipads. Oops. One night we had hamburgers and hot dogs on the grill with corn on the cob. As I handed Biruk his plate, he looked at me and said, “Mom, is this Chinese food?”. 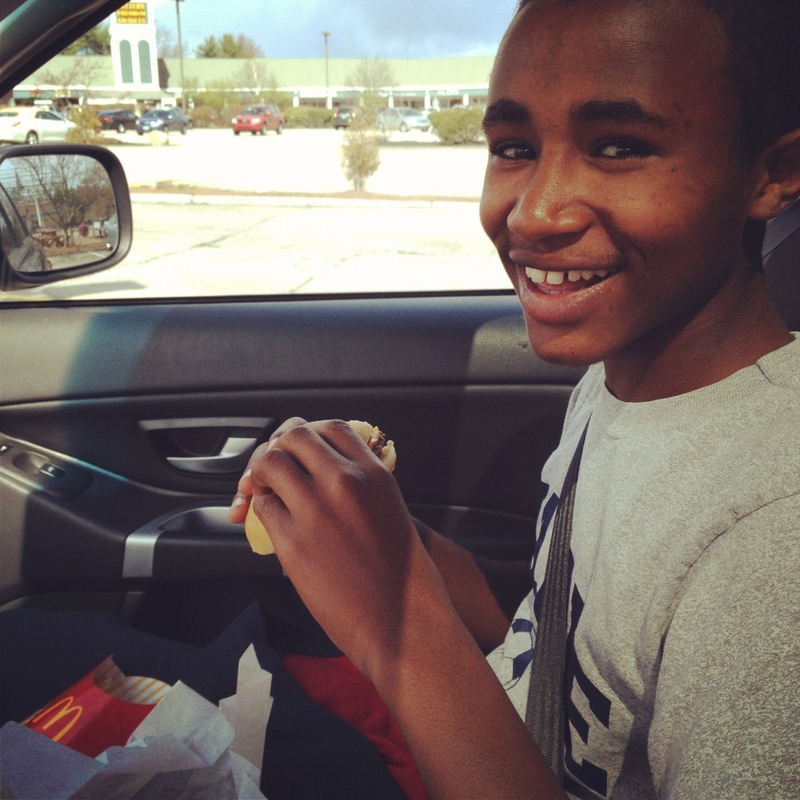 After his first bite of a McDonalds cheeseburger he said, “yummmmmy”. He hates American jeans. He says they have no fashion. After touring the local high school he said, “I guess I will have to wear stupid American jeans”. These past weeks have been filled with smiles. There is a lot of teaching and learning taking place in our house these days. I had to deliberately teach him how to make a sandwich for his lunch – like step by step (here is where we keep the meat, here is the bread, here is the mayo, this needs to go in the refrigerator overnight). Of course he had no idea if he liked ham or roast beef, so he had to taste them both. 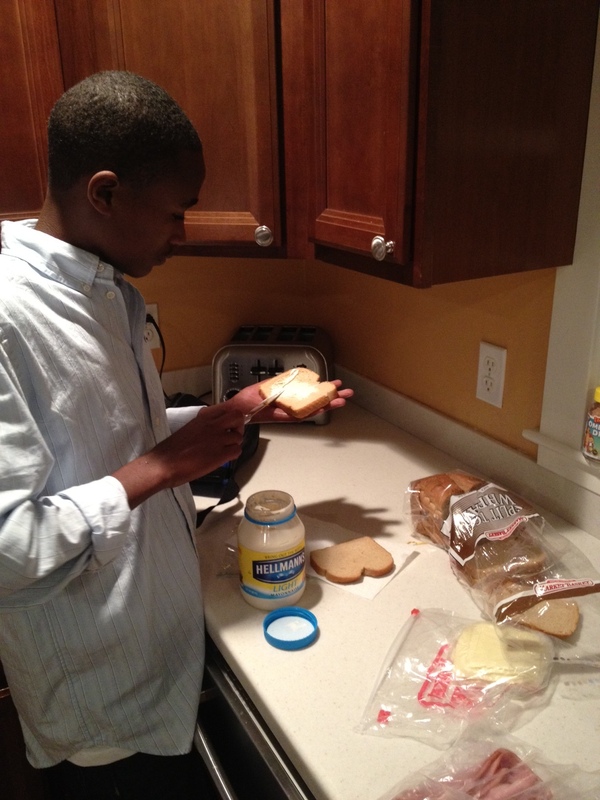 He learned quickly and now makes himself sandwiches whenever he wants. Almost everything is like that. How to use the toaster, how to open the garage door, how to use the remote control (I still haven’t mastered that one), how to tell time, use money, what a check means, which bus to take, what to wear to school, when to pack a jacket, how to use a combination lock, etc. Even though Biruk has been studying English for 2 years, language has been his biggest challenge – and that’s just going to take time. He started school last week and he has been warmly received by his peers and teachers. One teacher told me that the kids all flocked to sit next to him. 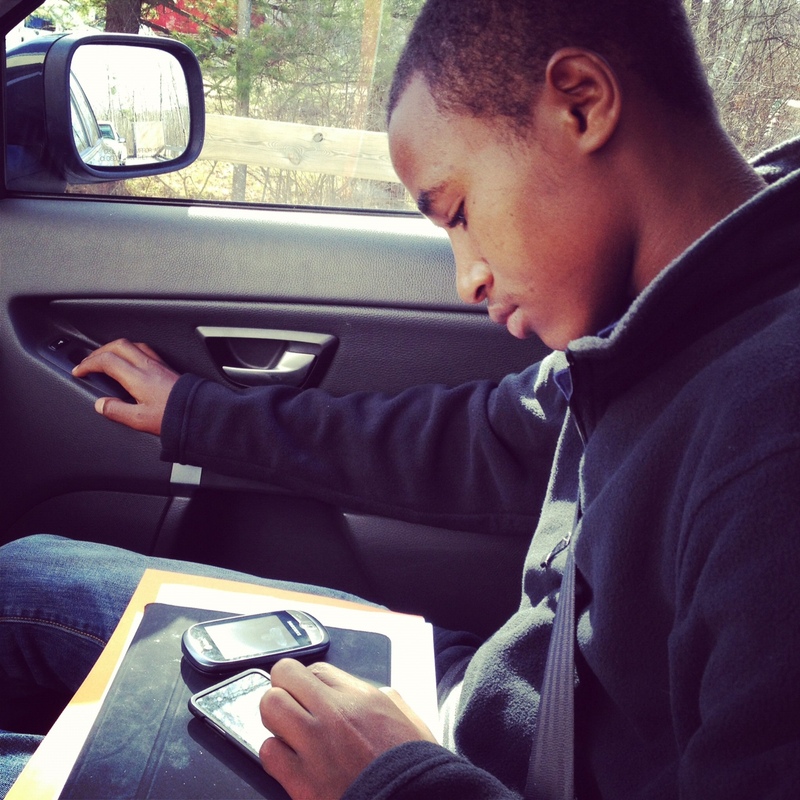 Since it’s late in the school year, he’s just focusing on conversational English and getting up to speed in math. The school has been great in terms of designing a special curriculum for him. He already has friends at school and at church. 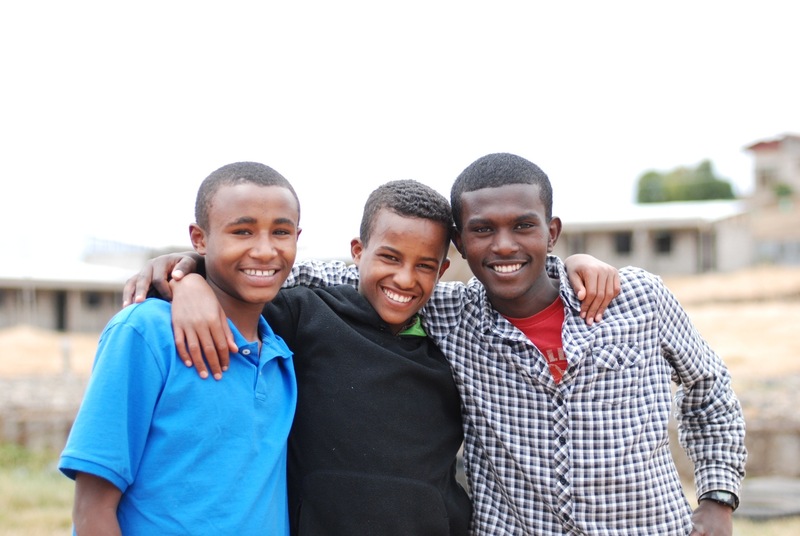 He also keeps in touch with boys from his former orphanage who have been adopted in the US, and friends who still live in Ethiopia. Overall, our first 30 days together have been great. Blissful. He is an absolute joy. My husband and I are over-the-moon in love with him. I think our transition has been so smooth because he has already been our son for several years – so much of the trust and bonding was already in place. We are all just really happy that he’s finally home. When Biruk is asked what he likes best about America he says, “being with my family”. We couldn’t agree more. We woke up excited to be home, but knowing that we still had a long day ahead of us. On the agenda was shopping, a coffee ceremony at Kolfe (Biruk’s former orphanage), and Heather had to meet with a lawyer regarding her adoption. We would fly out at 11pm (our plane would stop in Sudan for refueling) and 9 hours later we’d land in Germany. We’d hang out in the airport for 5 hours and then we’d board another plane headed for Boston. The journey would take almost 28 hours from the airport in Addis to the airport in Boston. It was going to be a long day indeed. Shopping was shopping. We’re girls, we love to shop. We picked up some goodies, stopped for lunch (I was fasting due to stomach issues), and then split up to go to our respective appointments. Heather and Tam set out on foot and took taxis to get to the attorney’s office. Wendy, Dani, Biruk, and I went to Kolfe for a coffee ceremony and for Biruk to say goodbye to his friends. We huddled together in a small room with about 30 people and watched women roast coffee beans over an open fire. The smoke filled the room and I found myself gasping to breathe. The director gave a short speech and then presented us with gifts (Wendy, Heather, Biruk and I each received a gift). The counselor also said a few words; the one thing he said that really struck me was that Biruk’s name means, “Blessed”. No one seemed sad. It was just goodbye. Biruk got in the car without any apparent emotion and we headed back to the guesthouse, where we would check out and prepare for the long journey ahead. We woke up itching. The red bites on our bodies seem to be multiplying. I had several on my legs, Wendy had several on her back, and Heather …well, Heather seemed to have them everywhere. Today was the first day that we had no real plans. Let me rephrase that: Today was the first day I have ever been in Ethiopia with no plans. 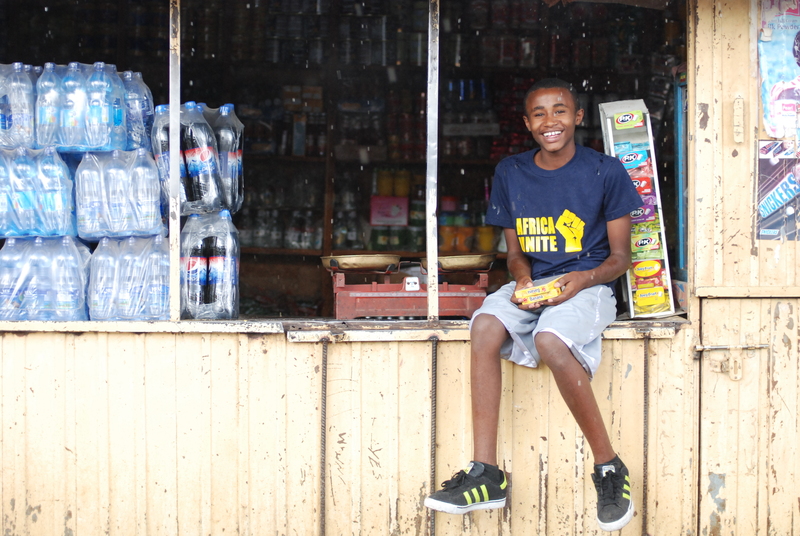 When I spoke to Biruk about this trip he asked me what we would be doing while I was in Ethiopia. Typically I’m leading a team with a tight agenda, and he is tagging along. I was pleased to tell him that this trip was only about him. I had no other agenda. I was determined to keep my promise to him. We woke up feeling lazy. Not necessarily tired, just kind of lazy. Though I didn’t “feel like” going to church, I figured it would be best so that Biruk could say goodbye to his church friends. Plus i figured the sermon would be on Joseph, cause thats just how God works. Dani arrived to pick us up…and then..somehow…we missed church. Plan B. We walked up to the lime tree cafe and had lunch. Heather decided to go back to Suluta to spend more time with M. After lunch Wendy and I stopped by the Boston Day Spa. Ever since our first trip to Ethiopia we have dreamed about going here. 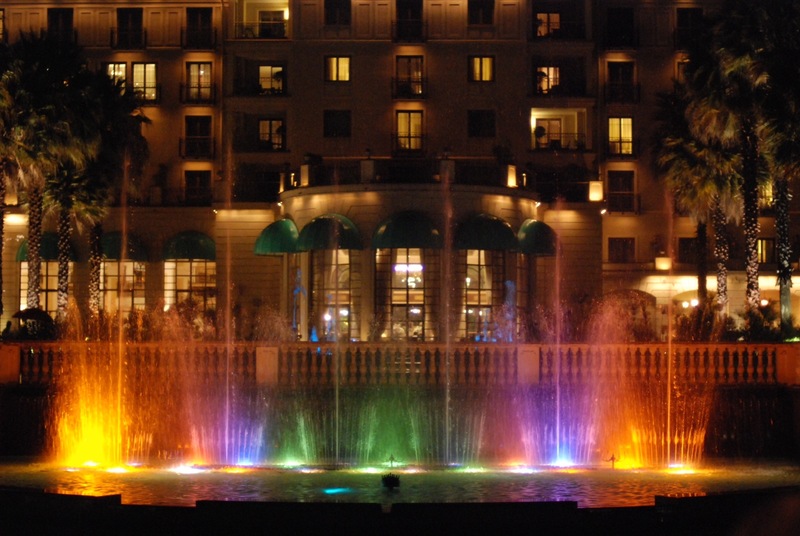 It’s beautiful – like a spa back home…except the prices are crazy cheap. A 1-hour Swedish massage is 250 birr. That’s $14. We planned to get a mani, a pedi, and a massage for under $30. Unfortunately, the spa had no water today, so we could only get massages. They were greasy, yet delightful. Unfortunately we still had our heart set on getting pedicures, so we found another spa that said they could do a mani pedi combo for 85 birr ($4). It wasn’t anywhere as nice as the Boston spa, but we had time, so we figured we’d try it out, we also thought it would be fun for Tam and Biruk to get pedicures with us. (don’t tell Dirt – this falls under the category of “what happens in Ethiopia stays in Ethiopia”, Dirt wouldn’t be down with his son getting a pedicure.) However, Biruk got all American on me and held his hands up, “no thanks”..and backed out of the spa. Wendy and I were escorted to a room with chairs (like waiting room chairs) along the wall. Then it became nothing like an American manicure. Wendy’s feet were in a home pedicure tub and my hands were soaking in a bowl of scalding hot water that was sitting on my lap. The young woman smiled and said, “This will be my first time giving a manicure”. Wendy and I exchanged nervous glances, I wanted out. Fast. I whispered to her, lets get out of here. Wendy looked down at her soaking feet, “its too late”. I called Tam over and gave him my seat and my bowl of hot water. He would get my manicure. Biruk seemed to be in a funk, so I thought I’d take him to Kaldis for a drink and some QT. It was the perfect solution; by the time we placed our order he was smiling again. We ordered drinks and then walked back to the spa to check on Wendy and Tam. Since they were still getting worked on, we headed back to the guest house. The rain began again, a beautiful sound in Ethiopia – before this week it had not rained in 5 months. Biruk and I laid across my bed playing with our iPads/iPods, talking about home, and giggling about events from the past week. Wendy and Tam arrived with pristine fingers and toes and joined us in bed where we face-timed our family and giggled until tears rolled down our faces. It was a perfect rainy Sunday afternoon. We went to Mukesh for dinner because they have an art gallery there. I wanted to see if Biruk would pick out a piece of Ethiopian art for his room. Tonight would be his last night sleeping in his country. Tomorrow night he will sleep on a plane, Tuesday night he will sleep in his new bed in Maine. That just makes me giddy. I finally slept through the night! Yahoo! We couldn’t wait to get to Suluta to see how Heather did overnight at HFTH. We ventured out towards Suluta with Biruk, Ayalew, and Sene for the party that Biruk was hosting at HFTH. Dani took a separate vehicle so that he could pick up the cake, fruit, and sodas. This was our first time going anywhere in Ethiopia without an interpreter. Biruk was the man in charge. Driving to Suluta requires an trek up Entoto mountain, a steep winding road. To make things more interesting, Ethiopian drivers don’t think twice about passing cars while going uphill around curves (with a very steep cliff). Each time we pass a car I find myself deep in prayer, eyes squeezed shut, braced for impact (sometimes I even squeal in fear). Yesterday’s driver was pretty adventurous…which meant that Wendy and I did a lot of praying (and squealing). We stopped for lunch on the way to Suluta and picked up some spaghetti for Heather, we were sure she’d be hungry. When we arrived at Suluta, Heather was no where to be found. I feared that maybe she had been eaten by a hyena in the night. I entered the cafeteria and spotted Heather, surrounded by girls, hair braided, smiling and laughing. She was quick to tell me how she had a great night and even enjoyed the breakfast and lunch. She didn’t need the spaghetti we brought, she was fine eating Ethiopian food with the kids. She looked so incredibly happy. She was glowing with joy and covered with bug bites. Biruk is normally very clingy. We joke that I should be carrying him around in a baby bjourn. He loves snuggling with me, holding my hand, wrapping his long thin arms around my shoulders, and kissing my cheeks. Thats normal Biruk. When we are at HFTH, he can become even more interested in my attention. I think it might have something to do with our sponsor son, Anwar. I always feel like I need to be careful about how much attention I give other kids when Biruk is around. Biruk has been really sweet to Anwar, but he does get somewhat territorial. At the end of the day, Anwar did manage to steal me away to give me a letter and some pictures he made for “Dad”. So sweet. After lunch it was time for the party. Since Biruk was hosting the party he was honored to cut the cake. Not long after the cake was handed out, Heather and M began smearing cake and frosting on everyone’s faces. A giant cake smash ensued. Once everyone cleaned the cake off their faces, we handed out gifts to all the children and then hugged and kissed the kids goodbye. 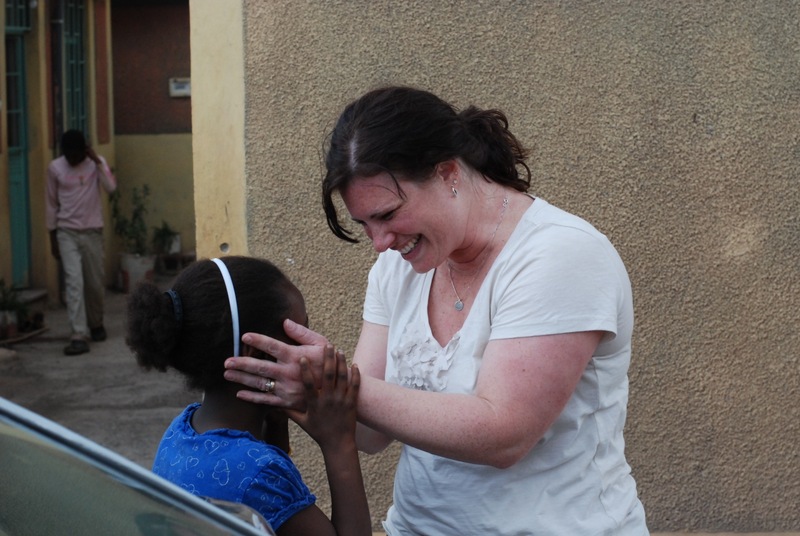 As you can imagine, the goodbye was extremely difficult for Heather and little M. She literally clung to her mama’s body – arms and legs wrapped tightly around Heather, refusing to let her go. Heather wouldn’t soon recover from that goodbye and the look on M’s face before she ran off to her room. If you are reading this, please stop and pray that M will be home with her family soon – this adoption process has taken too long. We went to Dani’s grandmother’s house for traditional Ethiopian dinner. Dani’s grand mom makes the best Ethiopian food. I don’t even like Ethiopian food, but I like Dani’s grandmother’s food. We ended the day at our new guest house. The trade off to having wifi was that Wendy and I were going to have to share a full size bed. …a very uncomfortable full size bed. Glad we are only here two nights. We started the day by visiting some missionary friends who live by Kolfe and have helped my mama-arms stretch across the world to Biruk. I met DeeDee two years ago in TX. At the time she and her hubs were just beginning take steps towards becoming missionaries and I was dreaming of adopting a sweet 12 year old boy who I met at Kolfe orphanage. 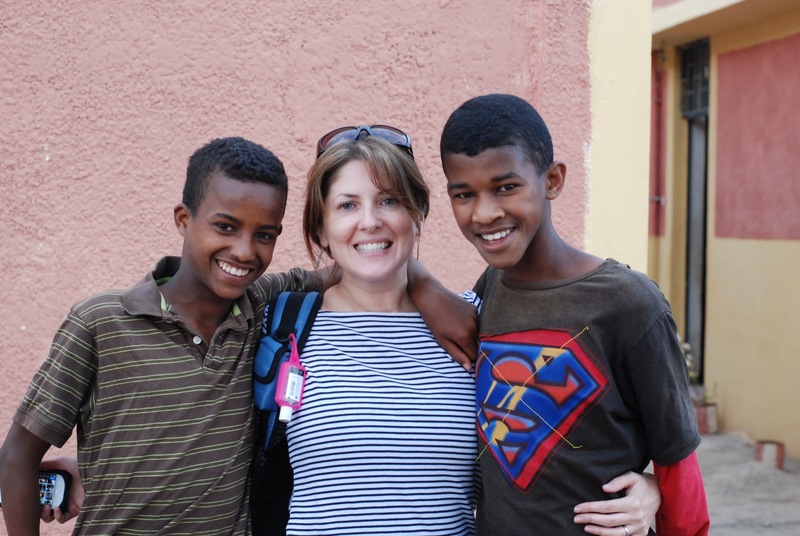 In July, DeeDee contacted me and told me that they just moved to Ethiopia, and asked if I wanted her to check in on Biruk. Her “check ins” we’re amazing, from attending church with her family to taking care of Biruk when he was sick, DeeDee became a lifeline to me. I will forever be grateful for the way she loved my son. After we visited with DeeDee and her family we went over to Kolfe to visit with the boys. It is always so great to bring new friends to Kolfe. The boys are amazing. Then we ran out for a “quick” lunch (there are no drive-thrus in Addis), which landed us at an interesting dining establishment, Chicken Hut. Chicken Hut wants to be fast food, but it falls short on so many levels. Chicken Bonee anyone? After lunch Heather and Tam set out to Suluta for an adventure….to sleep at the orphanage. I can’t describe how much courage this took – especially for someone who is afraid to keep in US hotels because of bed bugs. However, the lure of spending the night snuggling with her daughter diminished Heather’s fears. Dani, Biruk, Wendy, and I embarked on our own adventure….our 3pm meeting at Gladney to meet Biruk’s birth family. I could tell that Biruk wasn’t super excited about this meeting, but I was. When we arrived at Gladney Biruk went off on his own and left us standing around in the parking lot like dorks. Finally we followed Biruk into the Gladney office and she escorted us outside to meet the family, who was sitting in a small room. To the left, Biruk’s older brother (34) – he looked so much like Biruk….an older, more filled out version. He probably thought I was a weirdo because I couldn’t stop looking at him. In the middle, sat his uncle (mother’s brother), who Biruk lived with after his mom passed and before he went to live at Kolfe. On the right, a pretty petite woman, his sister (24). All were smiling as I entered the room, and stood as I walked toward them to give them hugs. As I approached them, I struck a refrigerator with my backpack and knocked a piece of pottery to the ground where it broke into several pieces. Talk about an ice breaker. Once I recovered from my embarrassment I hugged them all, then the meeting began. It was amazing. Seriously amazing. They told me how Biruk, being the youngest child in the family, had a very special place in his mothers heart. She loved him so much and had great aspirations for him. As the translator was describing this to me I immediately thought of Joseph, from the bible. I almost said it, but i didn’t want to imply anything about the siblings. They told me that they were so happy for him to have a new family and they gave me their blessing. A few moments later, the uncle spoke for several minutes and then the translator explained that the uncle believed that like Joseph’s family was blessed, so would their family be blessed too. That was a God-moment. Joseph. Joseph! We ended the meeting by taking pictures with the family. I seriously could’ve spent the entire day with them; I was filled with love. The amazing thing is that Dani knows this family, they live close by and they go to the same church. I am so sure that I will see them again someday. After our meeting, we met up with the Lehmans again (yeah, we love the Lehmans), who had rented a van and were taking some of the Kolfe boys out for the night. We went to dinner with several of Biruk’s friends, then to the Sheraton for a light show, then for ice cream at Kaldis. Our plan for today was simple: embassy. It was the reason we were here. Biruk would need to get his visa so that he could enter the US and become a citizen. Biruk woke up with a nose bleed, which I responded to by saying, “you are a Moore” (my kids are big time nose bleeders – a gift from their paternal gene pool). We spent some time hanging out on the balcony of the guest house, watching the bustling street below. There was a steady procession of people walking in all directions, men carrying shovels, business women walking in heels, students with backpacks, men herding goats or cattle, children carrying babies on their backs, buses, cars, animals – the street was alive at 8am. I turned to Biruk and said, “you know, you are going to miss this place”. He remained quiet. I thought for a moment about 8am on our quiet rural cul-de-sac. “America is nothing like this. You are going to miss it, but you can come back and visit any time you want”. He was nervous all morning. No matter what I said to console and comfort him, he was determined that he would not allow himself to rest in our adoption until the final paper was stamped. Who could blame him? Over lunch he kept checking the time and became increasingly concerned about us arriving late. He is a nervous nelly – clearly a trait from my side of the family. Embassy was uneventful, which was perfect. The building looked like any other US government building. The whole experience was not unlike being at the DMV. I was greeted by our Gladney representative, who encouraged us to sit with the other Gladney families – who were all strapped with baby bjorns. My baby was definitely different than all the other babies at the embassy. That moment seemed to mark the end of our adoption process…at least from a paperwork and process perspective. It was a good moment and Biruk’s eyes lit up when he heard his name in conjunction with “US citizen”. We decided to head to Suluta to visit the kids at Hope for the Hopeless orphanage (HFTH), in particular -it was time for Heather to see M.
We arrived in Suluta before the kids returned from school, which gave us time to tour the new school building (under construction) and chat with Surafel, the founder of the orphanage, who was visiting from AZ. When the kids arrived, we were greeted by 51 hugs from 51familiar smiling faces. It had been a year since our last visit and many of the kids had grown. Among them, our sponsor son Anwar, who seemed to be shell-shocked that I was there. We reminisced together about the day Wendy and I met him (3 years ago) on the front porch of the drop in center – it is so great to have history and happy memories with these kids. Heather and M were all smiles, hugging and playing. Heather pulled out her iPhone and shared videos from her recent ski trip, which drew a crowd of kids who were intrigued by the “ice on the ground”. 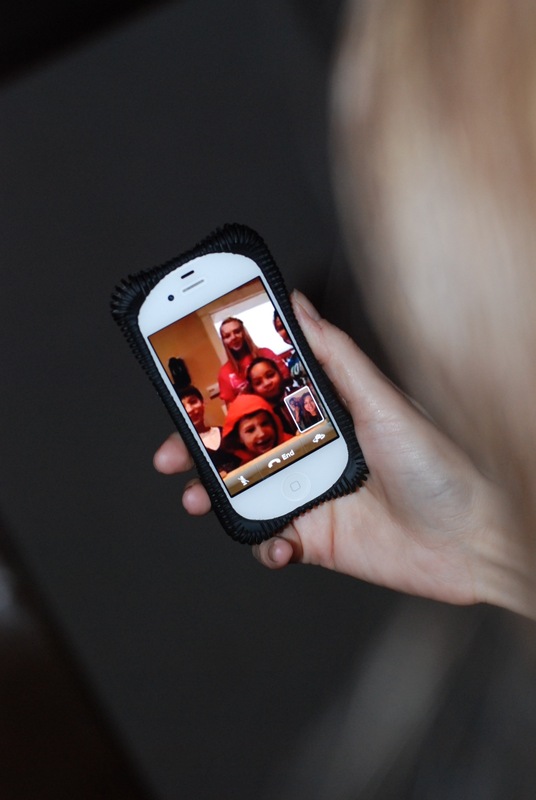 Wendy also pulled out her iPhone and shared pictures and games with a crowd of boys. We ended the day by having dinner with Tam and Dani at Churchill hotel. The fantastic thing about Churchill hotel was that we could get free wifi in the restaurant. Let’s just say that there were a lot of “glowing faces” around the dinner table, as each of us logged in and connected with the outside world (including a face time chat with Dirt). I’m typing this at 4am. Our strategy tonight was to ward off those pesky ear buzzing mosquitoes by leaving our bedroom window closed. Unfortunately this means that there is no breeze or cool air coming into our room…which is making it a bit toasty – particularly for me because my bed is dressed with fleece sheets, a fur blanket, and a fleece comforter. …which would be fine if I were at home in the arctic tundra otherwise known as my bedroom, but here, I’m afraid I’m going to combust. One wrong turn and the static electricity sparks that light up my fleece covered cocoon might ignite. We drove to the guest house and caught up with our dear friends Dani and Tam. Biruk huddled in close to me, resting his head on my shoulder and plopping sporadic kisses on my cheek. My mom-o-meter was registering at 200% mom-bliss. Biruk had spent the previous night at Tam’s house. 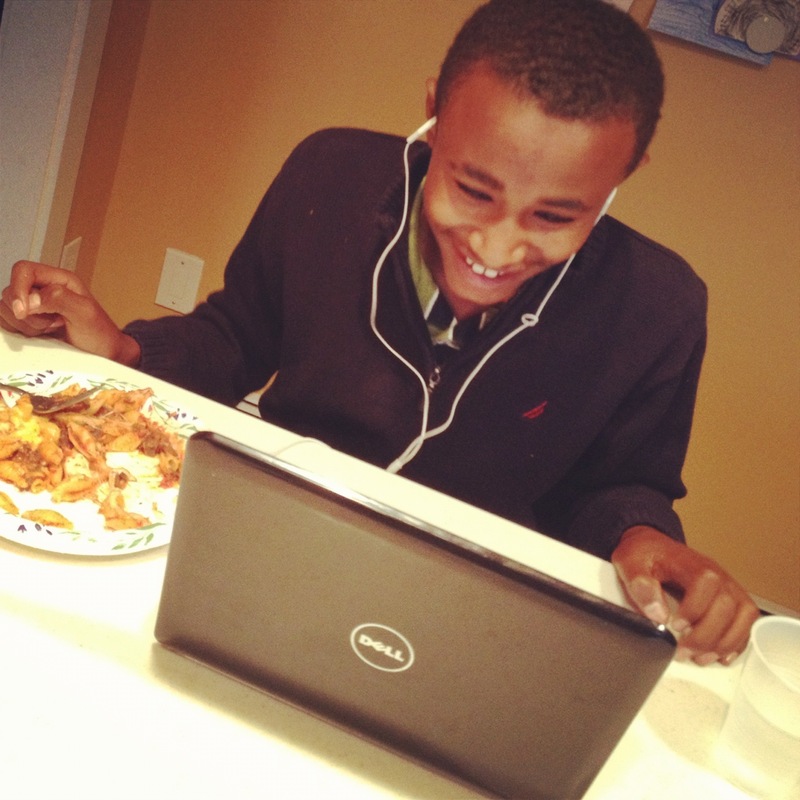 Tam laughed as he told us how Biruk had asked if they could just watch movies all night – he was too excited to sleep. Before long, I handed Biruk his itouch, which was loaded with music and games. 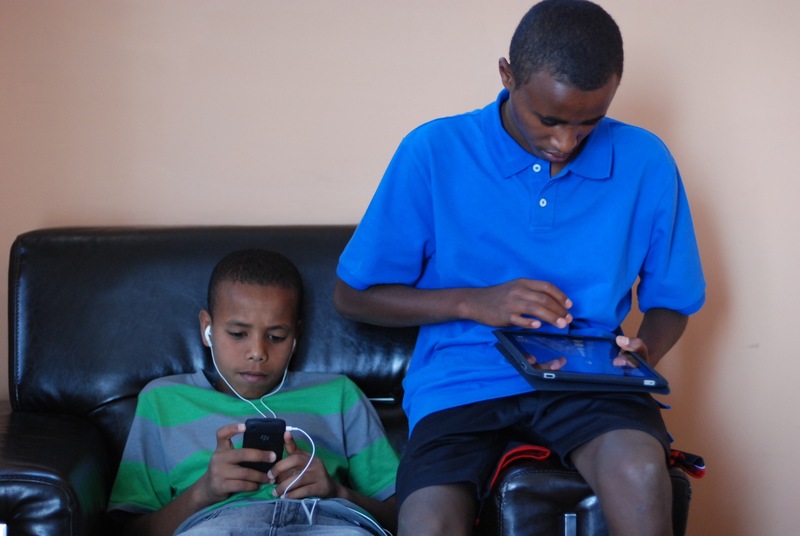 Biruk loves technology and gaming, and it didn’t take long for him to become addicted to Temple Run. Four kids, four Temple Run addicts. Awesome. I showed Biruk his side of the suitcase, which was packed with his clothing for the week. He was happy to kick off his flip flops and put on his new sneakers. (yes, the ones that were empty on our Christmas card). Then he handed me his belongings, the things that he had packed from his orphanage that he wanted to bring with him to America. My heart sank when I saw what he was bringing from his old life to his new life: an Amharic New Testament Bible and a zip lock bag filled with pictures (most that I had sent him over the years). The contents of personal value that he had accumulated in the first 15years of his life could fit into a 5×7 envelope. Tomorrow we will go to our embassy appointment. I am excited to close the final chapter of our adoption journey. This is truly the final step of the process. Once we get through our embassy appointment we will head to Suluta to visit Heather's daughter Merima and our sponsor son, Anwar. I can't wait to see Merima and Heather together bonding as mother and daughter. My heart is full just thinking about it. It is the end of day one and already I can't wait to get home.